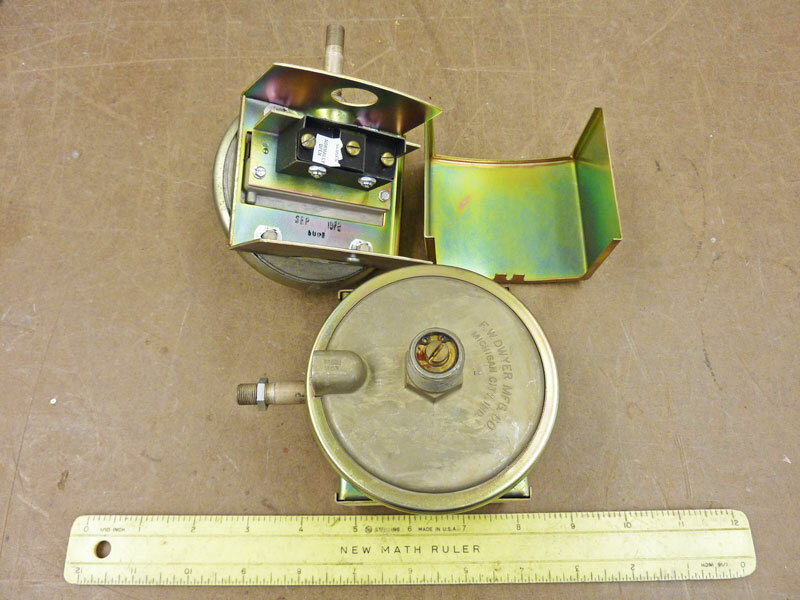 1 Bodine 828VG051 type KCI-22C4A1 bi-directional motor commonly used for raise/lower functions on transmitters. 115 VAC/60 Hz/1-phase/7.5 watts. Runs at 5.5 RPM, has 75 inch-ounces of torque, and has a 1/4' diameter output shaft. Included is a .85 MFD/220 VAC capacitor. Used, but in good condition. $60.00 each. 1 Hammerlund 85 millihenry RF Choke in a black plastic cylindrical container that is 1-3/8" diameter and 1-3/4" high. Two mounting tabs for 6-32 hardware make the base 2-3/16" across. Good used condition. $25.00 each. 1 Meissner 19-2035 2.4 mh/125 m.a. encapsulated R. F. Choke. New unused in the original box and in excellent condition. $15.00 each. 4 Miller 4662 1 mh/160 m.a. pi-wound R. F. Choke. New unused in the original box and in excellent condition. $15.00 each. 5 Miller 4672 10 mh/100 m.a. pi-wound R. F. Choke. New unused in the original box and in excellent condition. $15.00 each. 1 Miller 4672E 10 mh/100 m.a. encapsulated R. F. Choke. New unused in the original box and in excellent condition. $15.00 each. 4 Delta TCT-2-N RF Current Transformer. 0.5 to 2 MHz 0.25 Volt per Ampere. Working and in good condition. $250.00 each. 3 Kintronic Labs JP-SB1 Two-Terminal 30-amp J-Plug Shorting Bar. Good condition. $25.00 each. 1 Kintronic Labs 306 Insulator Bowl. 5-3/8" OD, 3-3/16" ID with 9/16" hole in the center. Has six 9/32" mounting holes around the outside. Used, but in excellent condition. $38.00. 1 Kintronic Labs KTL LC-3-12 Lighting Choke. Three #12 wires for 15 amperes of tower lighting. 14-/4" long x 4-1/2" diameter. Good used working condition. Complete with six .01 mfd/1200 volt bypass capacitors and porcelain stand-off insulators. $260.00. 2 Solid brass threaded rod for use with insulator bowls. 9 inches long x 1/2 inch diameter with six nuts and three lock washers. Used, but in good condition. $35.00 each. 3 Kintronic Labs Plexiglas windows for meters. 5-1/2" x 5-1/2" x 1/4" thick. Six 3-16" mounting holes drilled in them. Used, but in excellent condition. $10.00 each. 4 Kintronic Labs Cork sheets for Plexiglas windows. 5-1/4" x 5-1/4" x 1/16" thick. Six 3-16" mounting holes punched in them. For use with above windows. New. $8.00 each. 1 18 uhy/20 Amp fixed inductor. Multronics 18-20. Measures 8" x 9" long. Used, but in good condition. $170.00. 5 Kintronic Labs L-30CLIP coil clips for 30 amp coils (3/8 inch diameter tubing). New old stock. Good condition. $15.00 each. 2 coil clips for fixed 30 amp coils (3/8 inch diameter tubing). Similar to above, only a little larger. New old stock. Good condition. $12.00 each. 4 coil clips for fixed 40 amp coils (1/2 inch diameter tubing). Used, but in good condition. $18.00 each. 1" x 3" and similar size pyramid style porcelain insulators, fiber washers, coil clips, etc. New and used. Just email and tell us what you need.